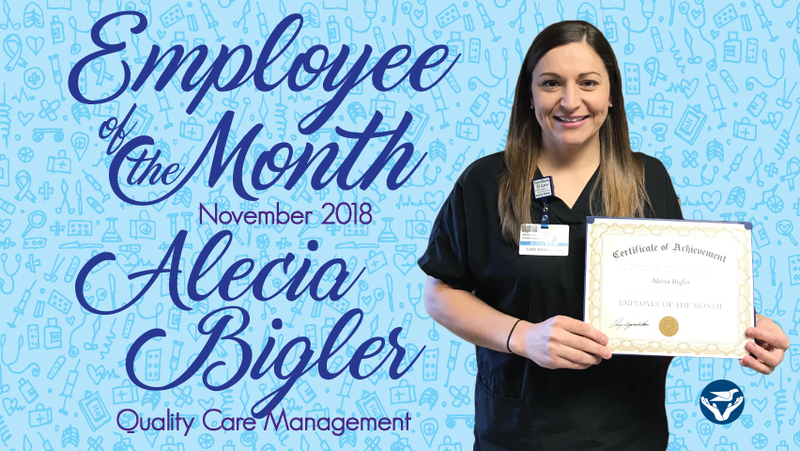 Alecia Bigler was selected as South Central Regional Medical Center’s Employee of the Month for November 2018. She is a Care Manager in the Quality Care Management Department and has been employed by South Central Regional Medical Center for 11 years. Alecia helps to assess patients’ needs, provide education, and assist with discharge planning. She said her favorite thing about working for SCRMC is the friends and relationships she has made during her time here. Alecia attended West Jones High School. She received her LPN degree at JCJC and her RN degree at Meridian Community College. Alecia is married to Seth Bigler. She has a daughter, Henley, a stepdaughter, Madalyn, and a stepson, Bradyn. Alecia said the proudest moment in her life was the birth of her daughter. Alecia‘s hobbies include spending time with family, crafting, and being outdoors. Her favorite TV show is This Is Us, and her favorite movie is Pearl Harbor.